If a contemporary visitor could recall the past using his imagination to envisage the Isthmus of Corinth in his initial situation, before the human work in accordance with the modern technology is involved, he would feel devastated in front of the size of difficulties that an ancient seaman had to face in order to transfer the whole ship and the valuable cargo unbroken from coast to coast. Periandros the tyrant of Corinth was the first man who seriously examined the option to open a canal through the Isthmus. However, scared by the Gods rage gave up his plans quickly after Pythia’s the priestess of the Oracle of Delfi request not to go ahead whith the accomplishment of his plan. Dimitrios the Besieger was the next that thought to create a marine passage at the Isthmus. He started excavations when Egyptian mechanics warned him that the level of the water between the two seas- the Corinthian and the one of Saronikos- will engulf Egina and other nearby islands, so he stopped them immediately. The idea of the creation of the canal at the Isthmus comes back in the frontline, and this time it was inspired by Julius Caesar and Caligula in 37 B.C. Nero firstly, reexamines the plans thoroughly and a year later he recruits a team formed by captives of the war from the Aegean Islands as well as 6.000 jewish slaves in order to work in the canal. After they managed to dig a trench of 3.000m in length and 40m in width, Nero had to leave for Rome in a hurry to suppress the rebellion of general Galva. There, he was arrested with the allegation of betrayal and in 68 A.C. he was sentenced to death. The work at the Isthmus stopped and the canal stayed halfended. The next historic personality that will be connected with the canal of Corinth, was Herod Atticus and right after the Byzantines. Neither of the two attempts had any success. The Venetians were the next who tried. They started digging from the coast of the Corinthian bay, but the huge size of their work made them give up during the night. So, since one after another try failed, the Isthmus seemed that it would stay forever seated according to the undetected will of the Gods None of them, and even more whose names have never been recorded, manage to connect his name with such a superhuman attempt against to the Gods’ “spells”. Kapodistrias the modern governor of the country, assigned a special study for the project of the Isthmus canal. The studies that appealed to the government were assessed as non realistic. So, for once more, this work remained without being accomplished. 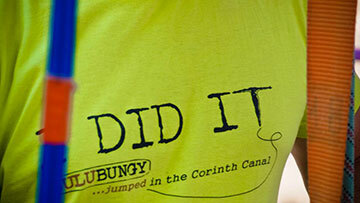 This year was a turning point as another canal work of huge importance is fulfilled. The Suez canal opens its gates to the naval traffic. Because of this work, in November 1869 the Zaimis’ administration enact a law which is entitled as “inauguration of the Isthmus of Corinth”. After that the government assigned the work to E. Piat and M. Chollet who were French contractors. A Hungarian constructor called Stefan Tyrr established the “International Company of the canal of Corinth” and undertook the work. The construction of the canal began in 23td of April 1882. The King of Greece George I was present to the official opening of the excavations. It is quite strange (and a historic irony) that the contemporary plans of the technicians almost followed the Nero’s plans which had been used since long. So the first naval travel in the canal inaugurated in a magnificent ceremony which was held in 25th of July in 1893. It was the justification of a dream and an idea that was first conceived 2.495 years ago. 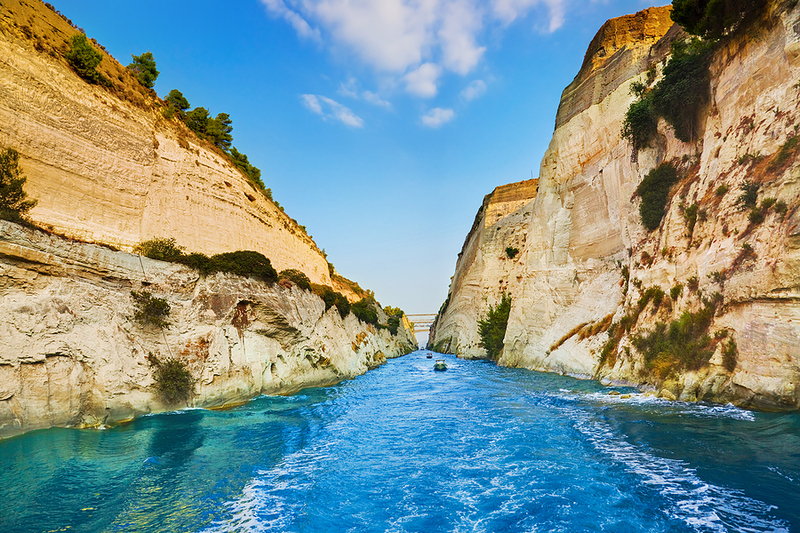 Periandros PLC affiliate of the Sea Containers Ltd, has undertaken the management of the canal of Corinth from the Greek government for 30 years. The aim of Periandros PLC is to create a tourist attraction and a universal tourist destination which is worth to be admired both of the tourists and the Greek travelers. The Isthmus canal of Corinth is a crossroad for the international sea transportations and serves ships of all nationalities. It provides the shortest and safest sea lane for the ships that coming from the Ionian Sea, the Adriatic, the South Italy and those which are passing through the Straits of Messina on the way to the East harbours of Mediterannean as well as well as to the Black Sea and the other way around. The canal split the Isthmus of Corinth in a straight line of 6.346m length. The width of the channel is 24,6m to the level of the sea and 21,3m under the level of the sea. The depth range is from 7,5m to 8m. Twelve million of cubic meters of soil should have been removed in order the whole passage to be cut. 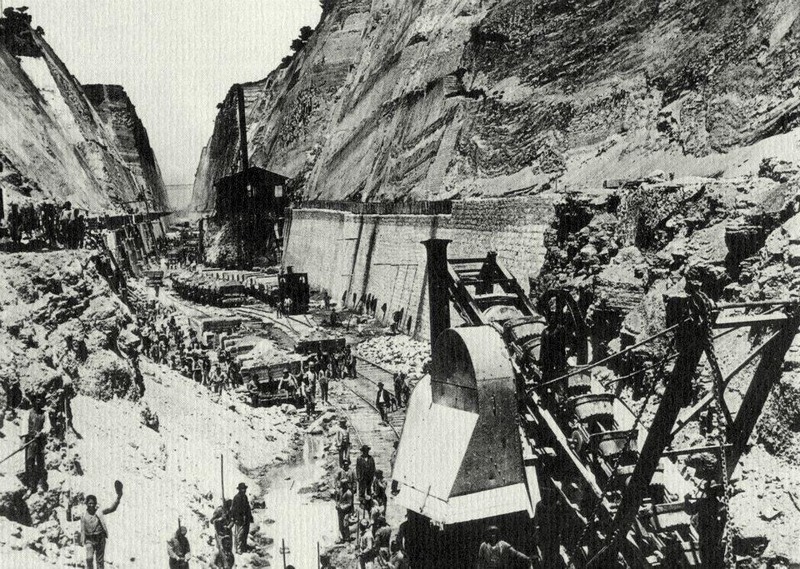 In 1944 the function of the Canal was interrupted for short time as the German army placed explosives to the sides of the Canal and turned 60.000cm of Earth into a cave. In order to make the repair of the Canal more difficult they sank compartments into it. The tow is obligatory for all the boats which are over 800 of pure capacity and the ships which transfer dangerous cargo. The usual percentage of flow is approximately 2,5 knots and it rarely exceeds the 3 knots. The difference between the high and low sea level is approximately 60cm. The boats that are passing through the Corinthian canal carry flags from over 50 countries.